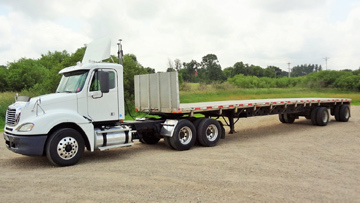 We are able to provide various trucks for your project including semi-trailers, crane trucks and semi drop deck trailers. We have solutions for all your crane and truck hire needs including lifting equipment cranes and glass transport trucks. 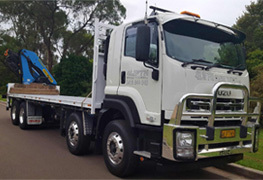 If you are not sure what truck you may need for your project, please contact us on 0412 244 848 and we can organise a site inspection to suggest the most effective truck for the job. Lifting equipment cranes are useful for heavy lifting and height lifting tasks. 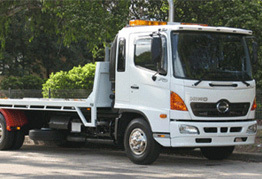 Rigid crane trucks with air bag suspension. Up to 8.2 metre trays. Rear mount Palfinger cranes up to 36002 with overload protection. Lifting capacity, 8 tonne at 3 metres, 1 tonne at 18 metres, 600 kgs at 25 metres. Fitted with a winch with a lifting capacity of 2.5 tonne. Carrying big loads can be risky especially it contains a lot of small things. 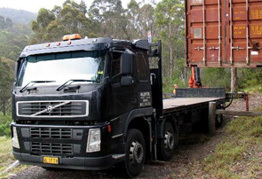 The safest solution is by storing the items in a container and have it carried by a table top truck. Semi trailers are perfect if you need to carry a lot of items in many containers using less trucks. If you need to carry big-sized goods in an open space but pickup trucks are not the right fit, then tray trucks can be your best choice.